I made this garlic bread to serve with the Manicotti. Well, let me rephrase that, I made this garlic bread weeks ago and stored it in the freezer to be quickly baked the night I made the Manicotti. I love garlic bread, but rarely do I keep a loaf of fresh french bread on hand to whip up on a whim. 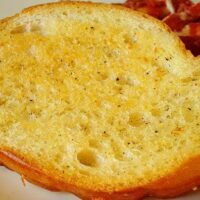 Even when I do plan garlic bread into my menu, often it isn’t until a later meal, days after the grocery shopping is done and I know the bread will long be stale before I use it. I was ecstatic to see this make-ahead garlic bread recipe in the latest issue of Cook’s Country. I made it the very next day after picking up some french bread, froze the slices for a few weeks and whipped it out the night I wanted to serve it. It was fantastic. A thousand times better than the garlic bread I usually wing when the craving calls. It was buttery and oh, so garlicky, and it had the most perfect touch of crunch and brown. Another carb-loaded item that I could not stop eating. I would gladly have eaten every piece of this and left the main meal to my kids. You should not be surprised to learn that my entire freezer downstairs is stocked with this manna from garlic-bread heaven! Using a fork, beat butter, garlic, sugar, salt and pepper in small bowl until combined. Spread butter mixture evenly over both sides of bread. Freeze the slices on a large baking sheet or plate until firm, about 15 minutes. After they are firm, transfer the slices to a freezer ziploc bag and freeze for up to one month. To serve, preheat oven to 425 degrees. Arrange bread on rimmed baking sheet and bake until golden brown on the first side, about 10 minutes. Flip and bake until golden brown on the second side, 6-7 minutes more. Serve. To serve the bread immediately instead of freezing, bake buttered bread on rimmed baking sheet at 425 degrees for 8 minutes then flip and bake 5 more minutes on the second side. This is a wonderful, easy recipe. It went perfect with our salad this evening. I doubled the salt because I used unsalted butter. (The recipe didn’t specify which type of butter to use.) Thanks so much. When you take the bread from the freezer, do you thaw it before baking? No need to thaw before baking. Oooohhhhh mmmmyyyyy! This was one of the best things I have ever eaten! And I know that seems silly to say about garlic bread, but, it’s true! I made it with store bough french bread the first time and it was divine. I’ve got a batch of french bread rising as I type this and I can’t imagine how good it is going to be with homemade bread! If you are having it with soup and just need a couple slices, you can toast it in a skillet (like a grilled cheese) and it is almost as good. Then no need to heat up the oven. This recipe is a winner! My DH loves it. I like that I can keep it in the freezer. It’s perfect for rounding out a meal of homemade soup, or pasta, or a main dish salad. We’re empty-nesters, and we don’t need a whole loaf of garlic bread. This recipe is brilliant! This is the best idea! My grocery store has a mark down bakery shelf where there are often lots of high quality artesinal bread loaves marked down to a dollar or two. I rarely buy them unless I am making french toast because they would need to be eaten right away. Today I bought a really nice loaf for $1.50 and made this bread for the freezer. It’s two meals worth for my family! I love that I control what goes in the garlic bread and the ingredients aren’t a mile long like the prepared loaves in the bakery or freezer section. I will be making this regularly. I did add 1/2 tsp. dried parsley to the butter mixture just for visual interest. I forgot to tell you that I loved this method of making garlic bread. We make & eat lots o’ garlic bread & this is my new favorite. 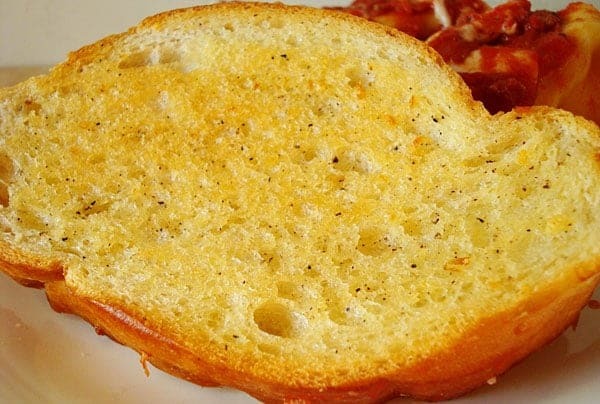 Made this tonight with your Skillet Lasagna recipe – 5 plates licked clean, with just a few crumbs scattered about from this DELICIOUS garlic bread. Cannot believe how easy it was and cannot wait to have the other half of it waiting for me in the freezer next time I need it. I don’t know why I’m surprised, those Cook’s Country people are the bomb. Thank you for sharing! Dude, I can’t believe I left my comment on the wrong post! Yes, I was talking about the cheesey bread. I followed the recipe up until the cheese part–I’m sure you already knew it would be good even without the cheese but I wanted to let you know how much we loved it! My hubby went crazy for it. Hi Veronica – I’m guessing that you are talking about the cheesy garlic bread, right?? Either way, I’m glad you loved it! I made this, sans the cheese, to go with your Mom’s Lasagna (I figured the meal already had enough cheese in it!) and it was FABULOUS! My husband and I ate 3/4 of the loaf by ourselves along with a big piece of lasagna. I plan on making the cheesey version next time we have pasta. But even without the cheese–it’s fabulous. Thanks for sharing! this is a truly great idea, and one that i’d never considered. butter, garlic, bread–manna indeed. Splendid Things – we must be kindred spirits because I ate this for dessert, too (but more than one slice)! Glad you liked it. Oh my! This bread is so delicious! Made it tonight for dinner and everyone really liked it. I had a slice for dinner and then a second slice for dessert! 🙂 I love the slight sugary taste. You know, this would be just the ticket. Can’t remember the last time I made garlic bread because of the time conflict. This is ingenious! What a novel idea! Just found your blog and I’ll definitely be back! I don’t know why I never thought to freeze my own garlic bread slices??? Buying a loaf of ready made garlic bread is a bit expensive for my family (as we always use two loaves) and like you, I buy it for a meal later in the week and then it’s stale. I will try this. Love your bread bowls by the way! I will be trying these too, but no mixer so I use a bread machine. Heh…. that looks delicious! i am looking forward to trying it! This is the best idea, ever! I can not stand French bread even the day after I buy it, but I also can’t stand going to the grocery store everyday. This might just be a life altering post! Can’t wait to try it with the manicotti. This is very cool! I’m excited! I never thought of putting sugar on it. Do you think it just balances out the flavors? I tried the Cook’s Country garlic bread this past Sunday when I made their (All-Time Best Recipe) Eggplant parmesan. Very good, I used LaBrea Italian style bread. I like the freezing idea! I won’t be making eggplant parmesan again. Eggplant is NASTY!!! Do you have a good chicken parmesan? I was thinking of substituting chicken for the eggplant using the same recipe? I’ve been wondering out that recipe. Looks like I need to give it a try. Thanks for sharing. OOoooh! that looks delicious! Great idea making ahead and freezing. Candace – that’s kind of funny about the eggplant. I’ve never tried it so I can’t weigh in but I’m sorry it was so nasty. I have the BEST skillet chicken parmesan recipe. I’ll post it soon but if you want it before then, email me and I’ll email it to you! I am so the same way–carbs are my thing! So I know I would love this. I love that you can make it ahead and then freeze it and have it still be awesome!